Turn left onto Jamesville Rd. Turn right onto Jamesville Rd. We would be happy to give your organization or group a tour of our new library building. To schedule a tour, please contact our staff at (315) 446-3578. You will need a valid ID as well as proof of your current address to get a library card. Usually, a current Driver's License will be acceptable. Stop by the library to fill out an application and pick up your card. Click the following link to download the guide to the library's services and information. The guide provides information about using your card, library events, collections, meeting rooms, borrowing materials, and more! To begin the online card application visit this link. Patrons who are at least 13 years old can begin their library card application online. When you register online, you will receive a temporary barcode number that you can use to request materials and do other operations online. Come into any library and verify your current address with a picture ID or two other forms of ID to receive your permanent library card. After you have your permanent card, you can begin borrowing items.In compliance with the Children's Online Privacy Protection act, you must be 13 or older in order to complete this registration. The overhang facing the reading garden on the east side of the building provides shade in the Reading Room during the hottest hours of the day. The sunk-in sides on the west use earth's constant temperature to regulate interior temperatures. The western sawtooth roof is the perfect angle for solar panels. We have four arrays of 60 panels which produce 24,000 kilowatt-hours of power annually. For more data on the savings from the solar panels, please visit the solar learning kiosk by the elevator on the main level. The west-facing, flat roof has plantings which absorb precipitation and alleviate stormwater runoff. The green roof improves the quality of the surrounding air, extends the life of the roof by sheltering it, and provides energy savings through natural means. Chives, Angelina Stonecrop, and Aizoon Stonecrop are grown on our green roof. Our meeting rooms have state-of-the-art light and occupancy sensors. The light level sensors change the brightness of the lights based on the available sunlight in the building, turning the interior room lights off if the sun is bright enough. In the spirit of international cooperation and friendship, the trustees of the Community Library of DeWitt & Jamesville welcomed the Okyeame Dankwa Memorial Library as its sister library on July 1, 2016. There are so many opportunities in becoming sister libraries including being able to learn about each other’s community, exchange ideas, and share cultures. The CLD&J looks forward to a long-term partnership and building a strong connection between our libraries and the people we serve. 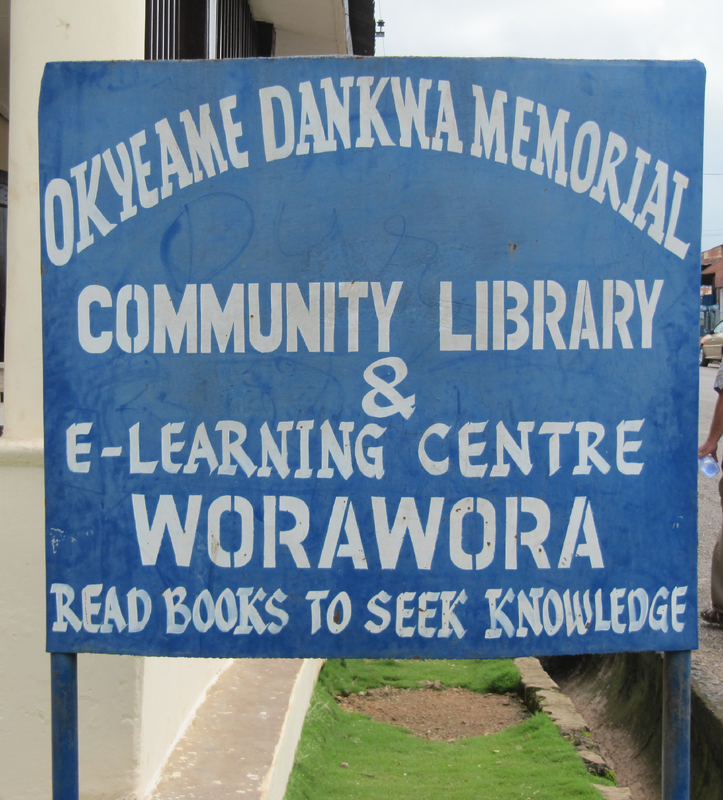 In 2016, DeWitt resident and PACE-Ghana board member Mary Kelly proposed the idea of partnering with the Okyeame Dankwa Memorial Community Library, in Worawora, Ghana. The CLD&J was excited about the prospect of joining with them as a Sister Library. Partnering with a Sister Library coincides with our mission to meet the educational and cultural needs of the community and support literacy. In the Summer of 2016, we sent a selection of children’s books to be added to their collection. We also began a “One World, One Book” program. Copies of Mix It Up by Herve Tullet and an illustrated version of the son What a Wonderful World by Bob Thiele and George David Weiss were sent to the Okyeame Dankwa library and displayed in our children’s room along with other books about Ghana and its culture. The goal was to connect the children at the two libraries through shared literature. Going forward we would like to work more closely with our sister library and the community in Worawora. The Okyeame Dankwa Memorial Community Library is located in Worawora, near the eastern border of Ghana in the Volta Region.